Neither species is resident in Singapore although historically the Malaysian would have been and it’s not impossible that it might re-establish itself. Listed as an uncommon non-breeding visitor (3) it could occur at any time of year as it is not that far to a breeding population in Johor. Hodgson’s should only occur during migration and is listed as a rare winter visitor and passage migrant, with extreme dates of 20 Nov to 27 Mar (3). Both species will generally only visit forested areas, with personal records from Chinese Gardens, Jurong Lake, the western cemeteries, Bidadari, Changi reclaimed land and no doubt appearing in many other forested patches. The full blown adult plumage of these two species is easy to tell apart. 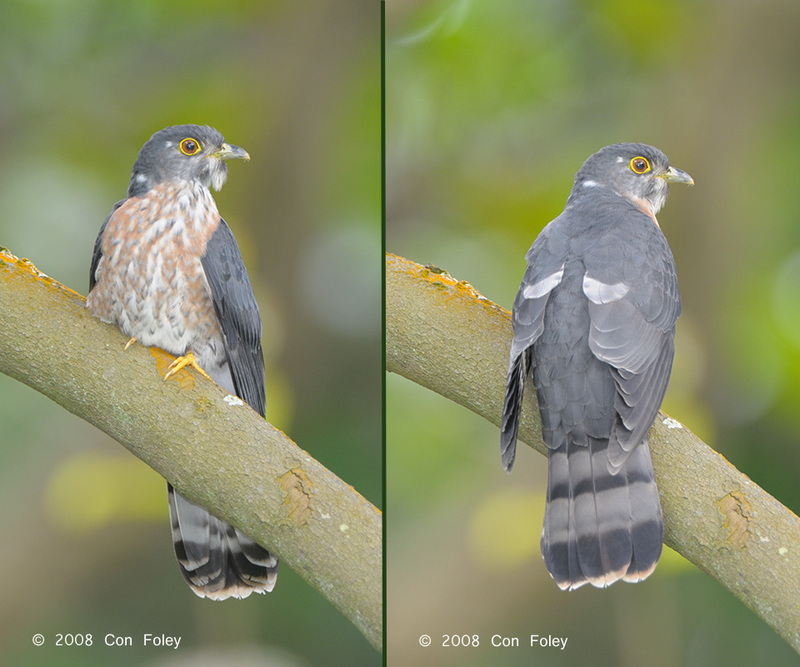 Here is the front and back view of an adult Hodgson’s Hawk-Cuckoo taken at Jurong Lake in 2008. A note about these images. It seems that the adult Hodgson’s does not visit Singapore as often as the juvenile, at least from personal observations I have only seen the adult once, but the juvenile several times. Many aspects of the plumage could be described, but note the very grey upper and the rufuous to pinkish undersides. Also see a pale tertial feather and a very small white patch on the nape. The subterminal band is not a K-pop group from Seoul but rather is the second to last bar on the tail. See that it is very narrow almost to the point of disappearing. 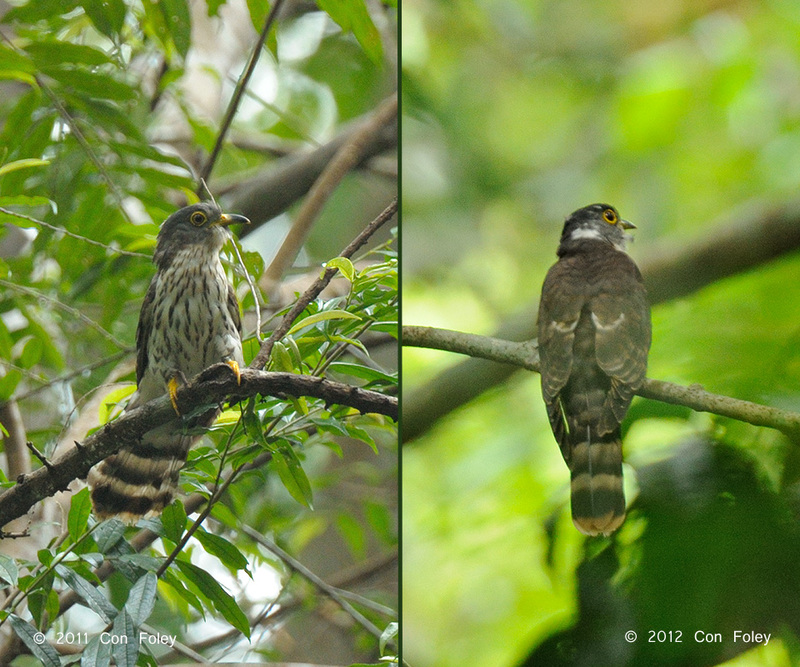 Now here is the adult Malaysian Hawk-Cuckoo front and back view, taken in Panti Forest. On its breeding ground the adult is very skittish so I’m glad to have even these images although they could be better. They were not taken in the same year as neither bird would fully cooperate and give both front and back views, but both images were both taken in June. May & June seems to be when the species is most actively calling and perhaps is the best opportunity for observation. See that the adult Malaysian can not be mistaken with the adult Hodgson’s. The chest of the Malaysian is fairly narrowly streaked very dark brown. Also there is a large white patch on the nape of the neck. And the subterminal band is not particularily narrow. Note however that the tertial feather does show some white. The ease of separation of the adult forms of these two species does not extend to the juveniles. And this is wherein the field ID challenges lays. But because of our close proximity to a breeding population of Malaysian Hawk-Cuckoos we have the opportunity to observe nearly the entire life cycle. 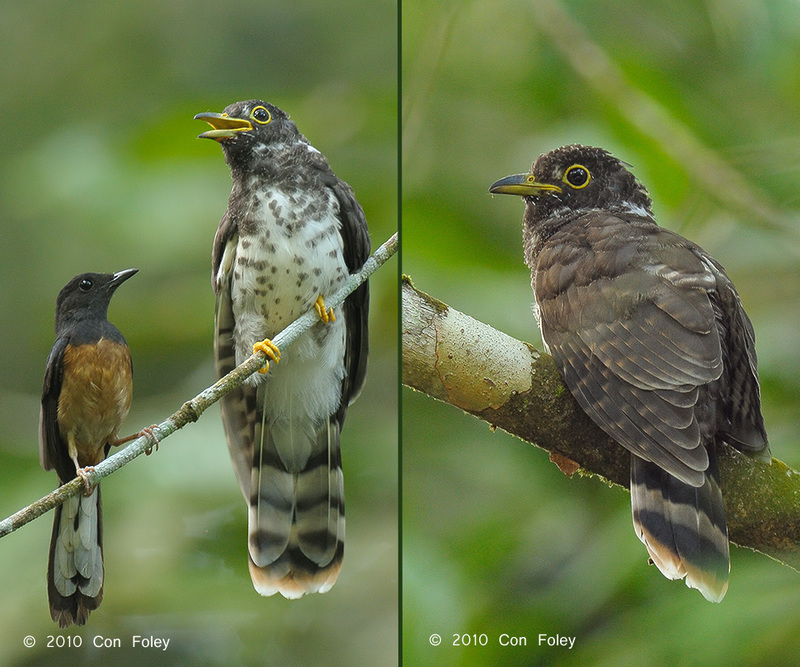 In early July 2010 I had the good fortunte to observe a recently fledged Malaysian Hawk-Cuckoo being feed by a White-rumped Shama (7). It can be seen that the chest is spotted with dark brown spots. Also there is a fairly large white patch on the nape. The front of the neck is still dark and hasn’t turned white as it will later. The bars on the tail are pretty even. There is a tertial with some white. The first year I noticed the fledgling being feed I learned what it’s begging call sounds like, and once I learned that in all subsequent years I have been able to observe this species at this stage of development, this year I found four fledglings. So it would seem that in Panti Forest this species is doing pretty well, at the expense of the shama. Best time for observation of the fledgling is early July to early September. The fledgling is not as skittish as the adult, but still must be approached with caution. 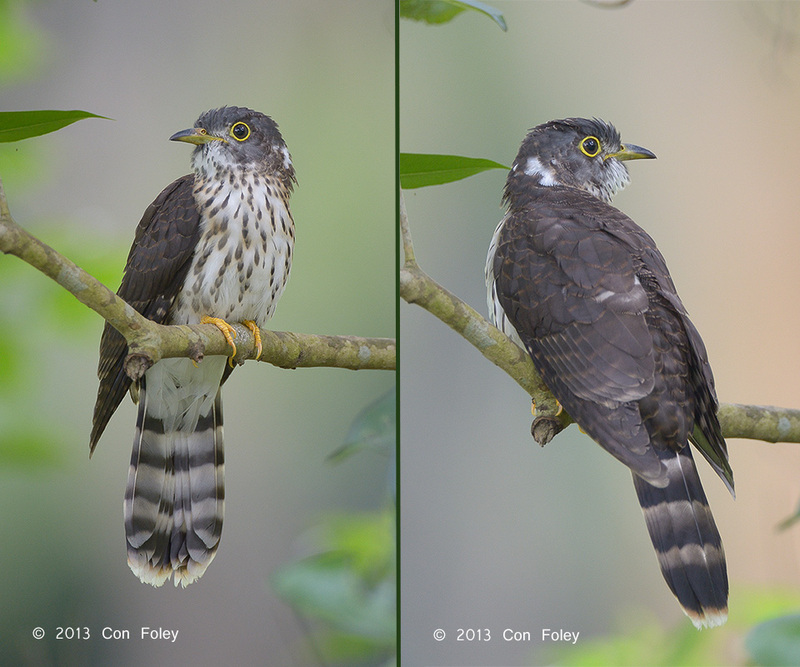 Now here is an image of the juvenile Malaysian Hawk-Cuckoo that was recently seen at Bidadari, these photos are from Oct 1 this year. The first clue is this may be too early for Hodgson’s, as the early date is towards the end of November (3). The next clue is notice the chest, the markings are rather spotted dark brown similar to the fledgling but perhaps showing some elongation of the markings. In the adult the dark brown markings are a bit longer still. Note also the large white patch on the nape and even tail bars. There is a bit of white on a tertial feather. Now here is an image of a juvenile Hodgson’s Hawk-Cuckoo from Bidabari on November 21, 2011, which is within the observed early date, not that we couldn’t set a new record at some point, and I have a personal record of November 2. 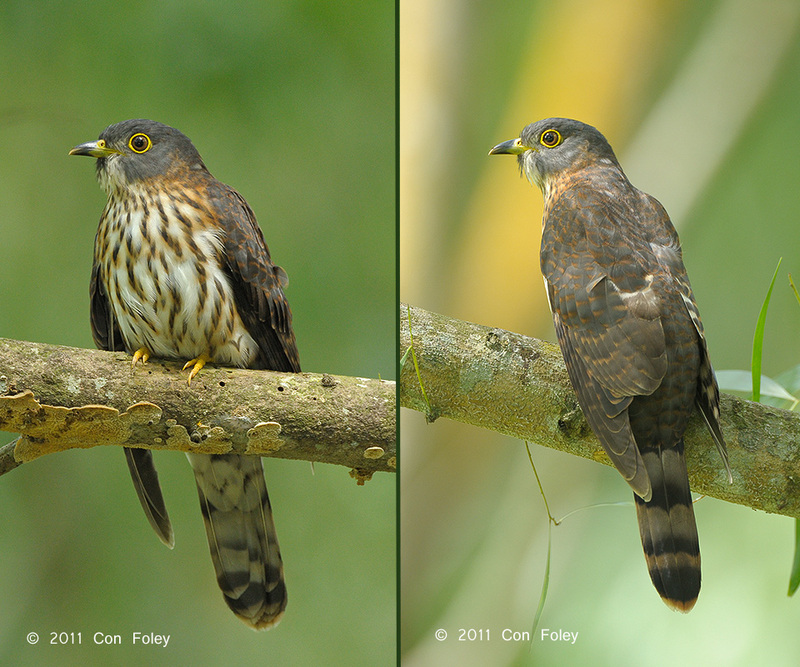 Note that the markings on the chest are quite different from the Malaysian Hawk-Cuckoo juvenile. Here they are much bolder, the streaks are longer and the color is richer, more rufous brown as opposed to the dark brown of the Malaysian. Also notice a very small white patch on the nape. The tertial is a bit pale. And the subterminal tail bar is noticeably narrower. The more rufous markings on the chest would seem to be a progression to the quite rufous almost pinks chest of the adult. It is quite interesting that while the Hawk-Cuckoos are in Singapore they are not at all skittish, in fact quite the opposite of their behaviour on their breeding grounds. They are typically very approachable, and if careful one may approach within a few meters. Typically they stay for only a few days, where they go to, whether it’s onwords to Indonesia is a great question. And where the Malaysian Hawk-Cuckoos come from, whether dispersal from close by breeding grounds or movement from a more Northerly population is also unknown. In my personal experience I have only seen juvenile Malaysian Hawk-Cuckoos in Singapore, never adults; and more Malaysian than Hodgson’s. Various authors discuss different aspects of plumage in an attempt to describe and separate the species. The quite obvious pale tertial on the adult Hodgson’s can lead to a discussion about to what extent the juvenile of either species has a pale tertial. But in my personal experience I have found the paleness of the juvenile tertial to be highly variable, so I now discount the presence or absence of a pale tertial as a key ID feature. For me in the table below are the top three features I use, with a particular emphasis on the first one which I have found to be the most reliable. The white patch on the nape can also be variable, and the width of the tail bar can be difficult to judge. But I have always found the coloration and nature of the markings on the chest to be much more rufous and bolder in the Hodgson’s. For me then getting a good view or photo of the front is most important, and then if using a photo taking particular care that the colors are presented faithfully without exaggeration. Hope this guide will help make your viewing of these species more enjoyable. This post would not have been possible without the pioneering work of Yong Ding Li and other authors listed. Also this post is the result of many conversations with Danny Lau, Lau Jia Sheng and Tan Kok Hui. (4) Wells, D.R. (1999). The birds of the Thai-Malay Peninsula, 1. London: Academic Press. (5) Robson, C. (2011). A Field Guide to the Birds of South East Asia. London: New Holland Publishers. (6) Erritzoe, J. et al (2012). Cuckoos of the World. London: Christopher Helm. Very good write up. Thanks for the info. Dear Con, an excellent account and very useful. Much appreciated. Dear Con, excellent photos and write-up. Very useful. Thanks to this article and another one published by the Singapore organization I am confident that the bird I took good pictures of near Jakarta on Java is a Hodgson’s. One of my shots is nearly identical to the view offered by the photo just above on the right. The kicker is that the bird was seen on 18 October of this year, 2014, which according to this article is quite an early date. I would be happy to submit said photos for consideration to the proper individuals or committee. Congrats on your record. Not sure who to contact to submit a record for Java but a bit of a search on the Internet will probably give you the answer. Hi Con Foley, Congrats upon well documented article for many people who do not have the opportunity to observe in detail these two species. I thought the most reliable feature is the narrow band on uppertail but guess in this case you’re referring to juvenile and in which case the pattern n colour of breast are most reliable? If you can see a narrow band then certainly that nails it, but it may not show well in young birds so you’ll have to use other clues. Took photos of Hawk-Cuckoo at SBWR in October 2014 and ID it as Hodgson’s Hawk-Cuckoo. Am still not sure if this is correct. May I send you to photos for you to ID?